By Keith Cowing on January 16, 2018 12:08 PM. "Now, industry officials and some congressional supporters of Mr. Bridenstine see the math becoming more challenging, partly due to factors outside their control. Last month's election of Democratic Sen. Doug Jones of Alabama narrowed the Republican majority, while continuing health issues could keep Republican Sen. Thad Cochran of Mississippi from voting in favor or the nomination. With Republican Senators Marco Rubio of Florida and John McCain of Arizona widely seen as firmly opposed for policy and personal reasons, Senate GOP leaders envision a difficult - and potentially monthslong - confirmation battle, according to industry officials and others familiar with their thinking. ... White House officials, however, are standing behind the choice and, according to outsiders tracking the process, aren't considering alternative candidates. ... "The president looks forward to Rep. Bridenstine's swift confirmation by the Senate, and is confident he will lead NASA to ensure America is a leader in space exploration once again," said Lindsay Walters, a White House spokeswoman." "Right now the expected support for Rep. Bridenstine remains exactly where it has been for him (and many other Trump nominees) for many months: split along party lines. With Sen. Rubio still in the "no" column. If the vote were taken in December (and Sen. McCain and Sen. Cochran were well enough to be in town to vote) it is expected that Bridenstine would have been confirmed 51 to 49. Senator-Elect Jones (D-AL) has now been seated so the expected vote would now be 50/50 with Vice President Pence casting a tie-breaking vote - if nothing else change interms of the party line split with everyone voting and Rubio's stance." Keith's note: Contrary to reporting by Wall Street Journal NASA Watch sources report that Sen. McCain is not against Bridenstine's nomination. Rep. Bridenstine's Bid to Become NASA Head Stumbles Amid Partisan Brawl, Wall Street Journal (behind paywall)\n\n\"Now, industry officials and some congressional supporters of Mr. Bridenstine see the math becoming more challenging, partly due to factors outside their control. Last month's election of Democratic Sen. Doug Jones of Alabama narrowed the Republican majority, while continuing health issues could keep Republican Sen. Thad Cochran of Mississippi from voting in favor or the nomination. With Republican Senators Marco Rubio of Florida and John McCain of Arizona widely seen as firmly opposed for policy and personal reasons, Senate GOP leaders envision a difficult - and potentially monthslong - confirmation battle, according to industry officials and others familiar with their thinking. ... White House officials, however, are standing behind the choice and, according to outsiders tracking the process, aren't considering alternative candidates. 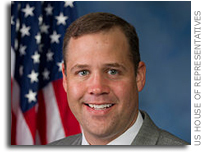 ... \"The president looks forward to Rep. Bridenstine's swift confirmation by the Senate, and is confident he will lead NASA to ensure America is a leader in space exploration once again,\" said Lindsay Walters, a White House spokeswoman.\"\n\nBridenstine Nomination Update, earlier post\n\n\"Right now the expected support for Rep. Bridenstine remains exactly where it has been for him (and many other Trump nominees) for many months: split along party lines. With Sen. Rubio still in the \"no\" column. If the vote were taken in December (and Sen. McCain and Sen. Cochran were well enough to be in town to vote) it is expected that Bridenstine would have been confirmed 51 to 49. Senator-Elect Jones (D-AL) has now been seated so the expected vote would now be 50/50 with Vice President Pence casting a tie-breaking vote - if nothing else change interms of the party line split with everyone voting and Rubio's stance.\"\n\n Keith's note: Contrary to reporting by Wall Street Journal NASA Watch sources report that Sen. McCain is not against Bridenstine's nomination. This page contains a single entry by Keith Cowing published on January 16, 2018 12:08 PM. Understanding The Health Risks Of Human Space Exploration was the previous entry in this blog. GAO: FAA Dropped The Ball On Launch Insurance is the next entry in this blog.